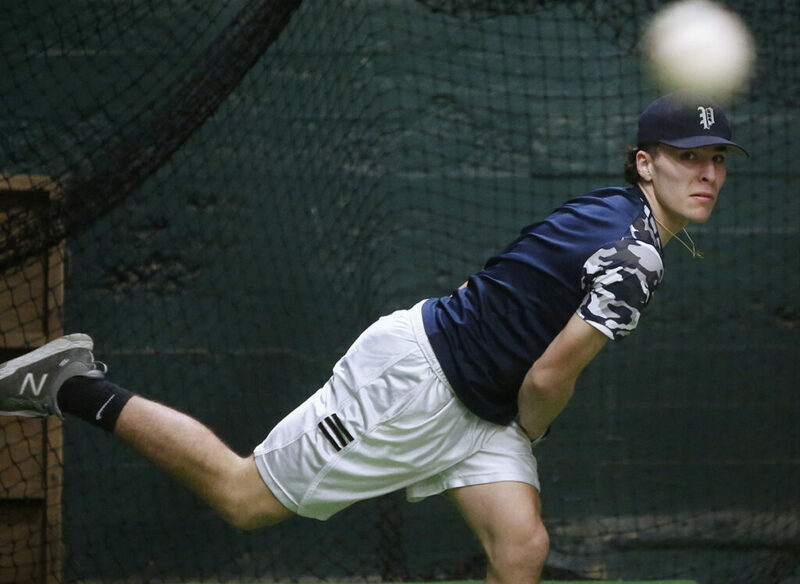 In the basement of the Portland Expo, beside wooden pallets and groundskeeping equipment, the Portland High baseball season started Monday on a patch of worn artificial turf. “I’m excited. We have a really good team this year so I’m excited to get to work,” said Portland senior right-hander Sonny Villani. Monday was the first day for Maine’s high school baseball and softball teams to begin throwing and conditioning practices. Across the state, teams took to gyms and other indoor spaces, perhaps moving outside for some long toss in a warming sun (the Bulldogs used the Fitzpatrick Stadium turf). Pitchers like Villani and right-hander Brian Riley were able to get in 60 pitches, mixing in off-speed stuff after a winter of throwing at an indoor facility. But for multisport athletes like returning All-State pick Donnie Tocci, who was 7-1 with a 1.40 ERA last year, the extra week helps with his transition from hockey. Tocci threw 40 pitches from the wooden prism that serves as a mound, all fastballs. The Maine Principals’ Association no longer sets limits on how many players can attend the first week of practices – it was formerly eight pitchers and two catchers – but does restrict the activities. No bats are allowed, and baserunning, pickoff and fielding drills are forbidden. Full-team practices begin March 25, the first practice day for other spring sports. Portland Coach Mike Rutherford had six veteran pitchers, with returning catchers Sam Knopp and Dante Tocci, report for the first day. With only enough space to have one pitcher throw at a time, Rutherford needs to split his group. “Tomorrow when I bring in the younger kids, the freshmen and sophomores, it’s important to teach them the mechanics that we want,” Rutherford said. Portland – which was 12-4 last season and a regional semifinalist for the third straight year – is scheduled to open April 11 at Hadlock Field against Biddeford. Tocci, Riley and Villani give Portland three solid returning starters, always a good place to build a team. And whether the baseball season begins in a basement or a sun-splashed Florida field, hope always springs eternal.